The Ring Nebula has an apparent magnitude of 8.8 and lies at an approximate distance of 2,300 light years from Earth. It has the designation NGC 6720 in the New General Catalogue. Messier 57 lies to the south of Vega, the brightest star in Lyra and one of the stars that form the Summer Triangle, a prominent asterism found overhead in the summer sky. 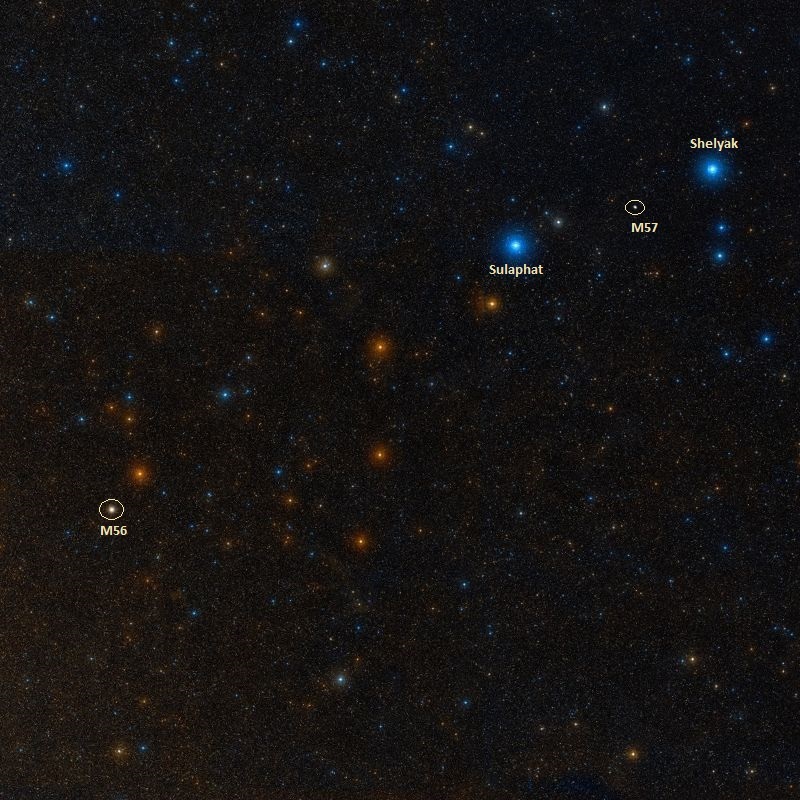 The nebula is easy to find as it is located roughly 40 percent of the distance from Sheliak, Beta Lyrae, to Sulafat, Gamma Lyrae. The nebula cannot be resolved in small binoculars and is best seen in 8-inch and larger telescopes. Even smaller telescopes will reveal the nebula’s ring shape, while medium-sized instruments will also show its interior hole. With a visual magnitude of 14.8, the nebula’s central white dwarf is a difficult target. The best time of year to observe M57 is in the summer months. 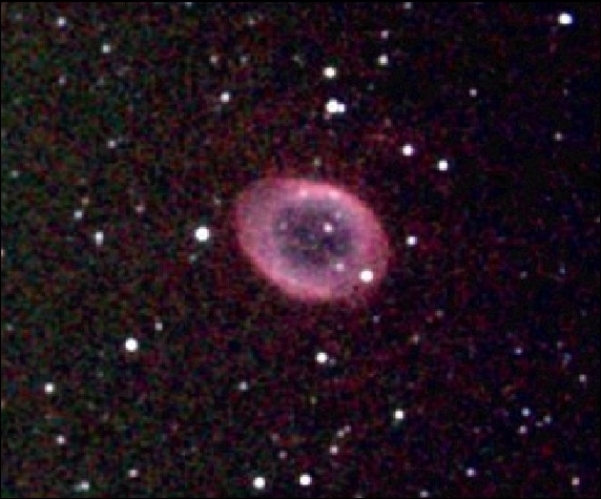 Messier 57 occupies an area of 1.5 by 1 arc minutes. It is classified as a bipolar nebula as it has thick equatorial rings that extend its structure through its main axis of symmetry, which is seen at about 30° from Earth. 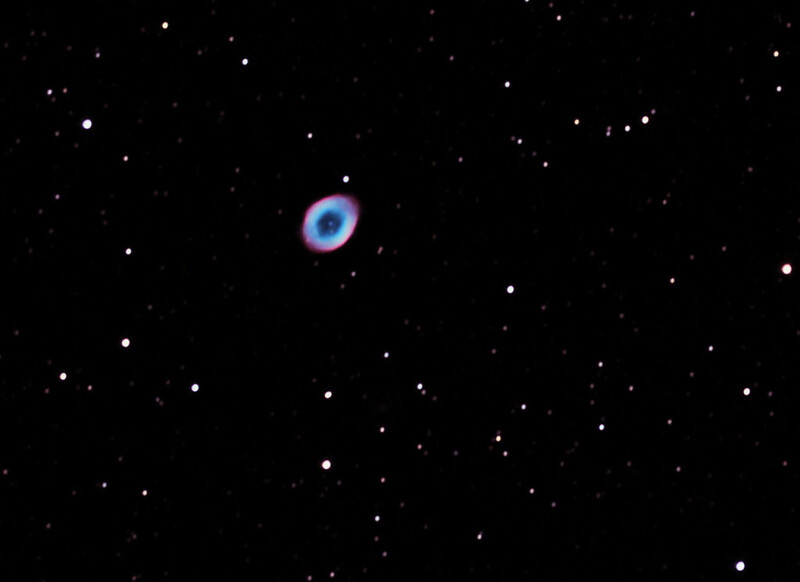 The Ring Nebula is one of only four planetary nebulae listed in Messier’s catalogue, along with the Dumbbell Nebula (M27), the Little Dumbbell Nebula (M76), and the Owl Nebula (M97). Planetary nebulae are formed when a dying red giant star expels its shell of ionized gas to form the nebula, while the star itself becomes a white dwarf, a dense stellar remnant roughly the size of the Earth. The central star of the Ring Nebula ejected its outer layers 6,000 to 8,000 years ago and they have since expanded over an area about 1.3 light years in radius. The nebula is expanding at a rate of about 1 arc second per century, which corresponds to a velocity of 20 to 30 km/s. The nebula’s ring shape appears in different colours and the different layers seen in images are not equally bright. This is because they consist of different layers of the central star, or different elements at different temperatures. The outermost layer, which appears red in images, consists almost entirely of hydrogen. Elements that appear in different colours include doubly-ionized oxygen, molecular nitrogen, molecular sulphur, and helium. The central planetary nebula nucleus (PNN) has an estimated mass of 0.61 to 0.62 solar masses and a surface temperature of about 125,000 K. It is about 200 times more luminous than the Sun. This nebula, to my knowledge, has not yet been noticed by any astronomer. One can only see it with a very good telescope, it is not resembling any of those already known; it has the apparent dimension of Jupiter, is perfectly round and sharply limited; its dull glow resembles the dark part of the Moon before the first and after the last quarter. Meanwhile, the center appears a bit less pale than the remaining part of its surface. 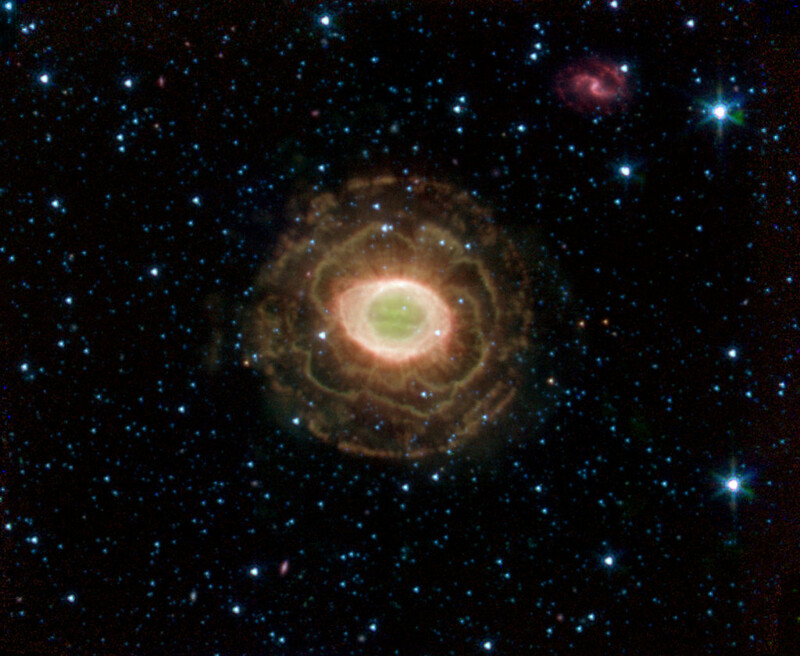 NASA’s Spitzer Space Telescope finds a delicate flower in the Ring Nebula, as shown in this image. The outer shell of this planetary nebula looks surprisingly similar to the delicate petals of a camellia blossom. A planetary nebula is a shell of material ejected from a dying star. Located about 2,000 light years from Earth in the constellation Lyra, the Ring Nebula is also known as Messier Object 57 and NGC 6720. It is one of the best examples of a planetary nebula and a favorite target of amateur astronomers. The “ring” is a thick cylinder of glowing gas and dust around the doomed star. As the star begins to run out of fuel, its core becomes smaller and hotter, boiling off its outer layers. Among the curiosities of the heavens should be placed a nebula, that has a regular, concentric, dark spot in the middle, and is probably a Ring of stars. It is of an oval shape, the shorter axis being to the longer as about 83 to 100; so that, if the stars form a circle, its inclination to a line drawn from the sun to the center of this nebula must be about 56 degrees. The light is of the resolvable kind [i.e., mottled], and in the northern side three very faint stars may be seen, as also one or two in the southern part. The vertices of the longer axis seem less bright and not so well defined as the rest. There are several small stars very near, but none seems to belong to it. It is the 57th of the Connoissance des Temps [Messier’s catalogue]. 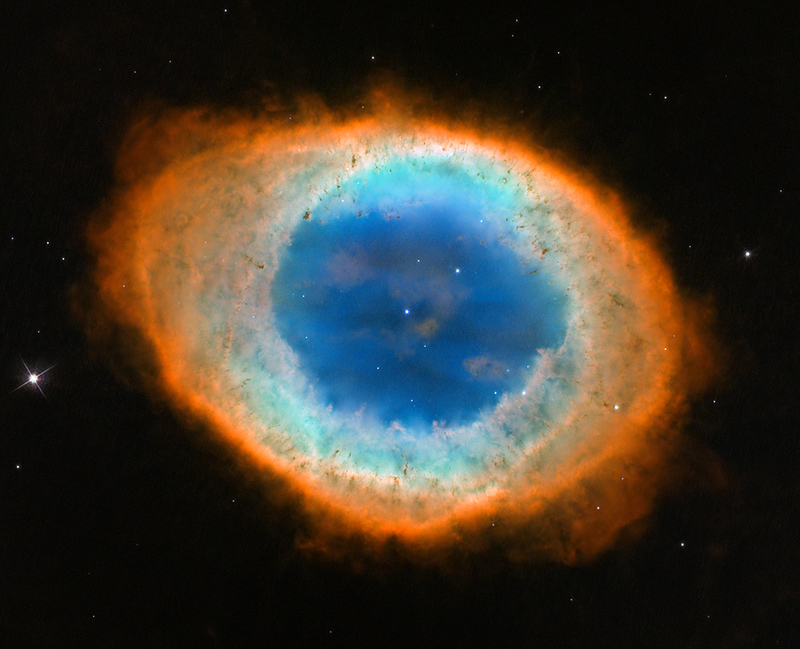 In 1800, German astronomer Friedrich von Hahn said he had seen the Ring Nebula’s central star a few years earlier, but could no longer find it. He also noticed changes in the interior of the ring. 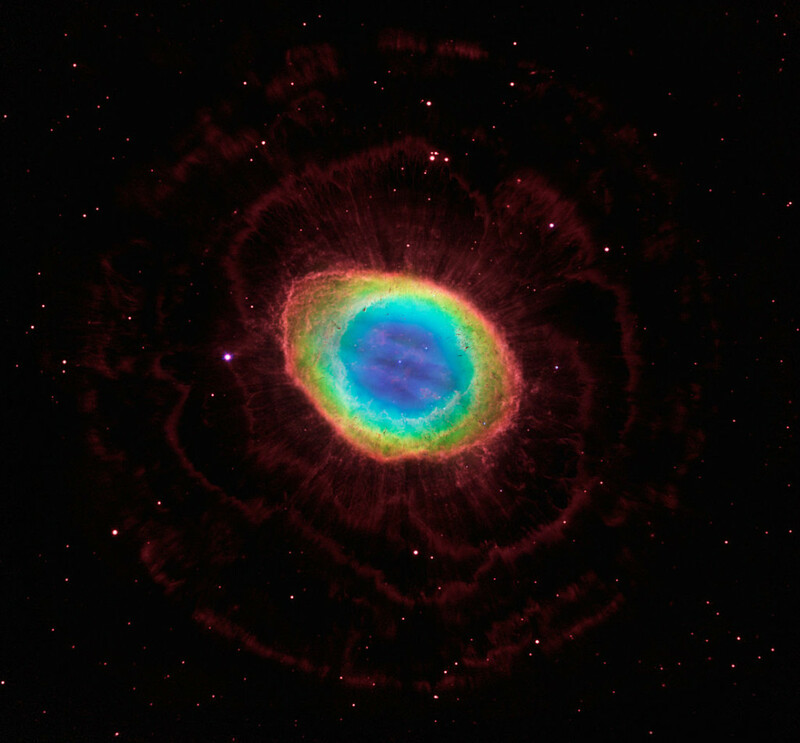 Ring Nebula. Atlas Image mosaic courtesy of 2MASS/UMass/IPAC-Caltech/NASA/NSF. Annular nebula between Beta and Gamma Lyrae. Position angle of longer axis of annulus is 57.0 deg by micrometer. The small star following is almost exactly on the parallel of its centre, distance about the same as the breadth of the ring. The central vacuity is not black; a nebulous light fills it. The edges are not sharply cut off, very slightly ill defined. Herschel later added the nebula to his General Catalogue as GC 4447. 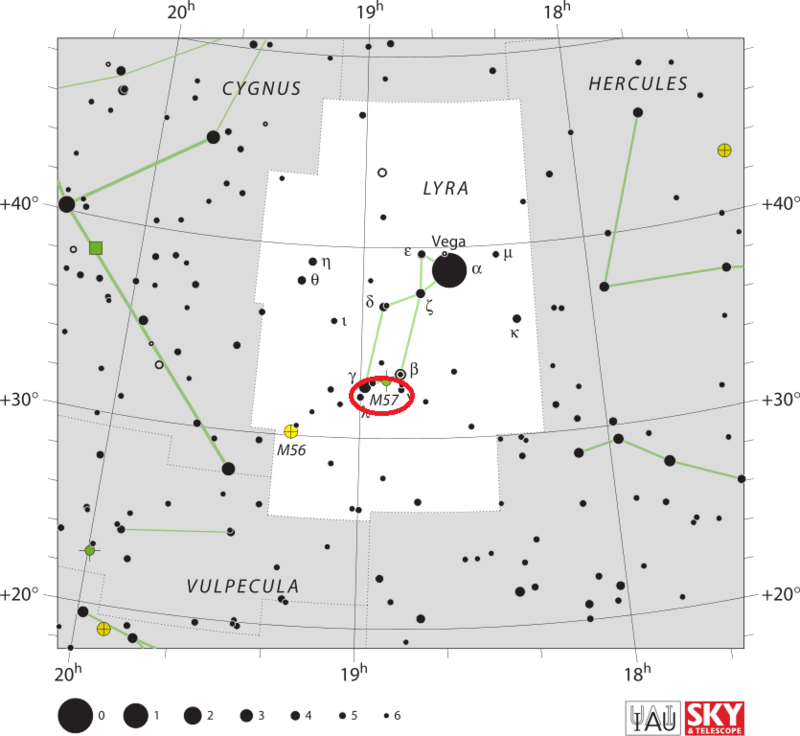 This annular nebula, between Beta and Gamma on the cross-piece of the Lyre, forms the apex of a triangle which it makes with two stars of the 9th magnitude; and its form is that of an elliptic ring, the major axis of which trends sp to nf [SW to NE]. This wonderful object seems to have been noted by Darquier, in 1779; but neither he nor his contemporaries, Messier and Méchain, discerned its real form, seeing in this aureola of glory only “a mass of light in the form of a planetary disc, very dingy in colour.” Sir W. Herschel called it a perforated resolvable nebula, and justly ranked it among the curiosities of the heavens. He considered the vertices of the longer axis less bright and not so well defined as the rest; and he afterwards added, “By the observations of the 20-feet telescope, the profundity of the stars, of which it probably consists, must be of a higher than the 900th order, perhaps 950.” This is a vast view of the ample and inconceivable dimensions of the spaces of the Universe; and if the oft-cited cannon-ball, flying with the uniform velocity of 500 miles an hour, would require millions of years to reach Sirius, what an incomprehensible time it would require to pass so overwhelming an interval as 950 times the distance! And yet, could we arrive there, by all analogy, no boundary would meet the eye, but thousands and ten thousands of other remote and crowded systems would still bewilder the imagination. In my refractor this nebula has a most singular appearance, the central vacuity being black, so as to countenance the trite remark of its having a hole through it. Under favourable circumstances, when the instrument obeys the smooth motion of the equatoreal clock, it offers the curious phenomenon of a solid ring of light in the profundity of space. The annexed sketch affords a notion of it. Sir John Herschel, however, with the superior light of his instrument, found that the interior is far from absolutely dark. “It is filled,” he says, “with a feeble but very evident nebulous light, which I do not remember to have been noticed by former observers.” Since Sir John’s observation, the powerful telescope of Lord Rosse has been directed to this subject, and under powers 600, 800, and 1000, it displayed very evident symptoms of resolvability at its minor axis. The fainter nebulous matter which fills it, was found to be irregularly distributed, having several stripes or wisps in it, and the regularity of the outline was broken by appendages branching into space, of which prolongations the brightest was in the direction of the major axis. The annular nebula in Lyra; 2 is the star in Sir John Herschel’s sketch; I have inserted the six other stars as in some degree tests of the power of a telescope. Near star 3 there are two very minute stars seen with great difficulty; the others are easily seen whenever the night is sufficiently good to show the nebula well. The filaments proceeding from the edge become more conspicuous under increasing magnifying power within certain limits, which is strikingly characteristic of a cluster; still I do not feel confident that it is resolvable. I am however disposed to think that it was never examined when the instrument was in as good order, and the night as favourable, as on several occasions when the resolvable character of fig. 26 [Messier 27] was ascertained. Hungarian astronomer Jenő Gothard was the first to photograph the nebula in 1886. He discovered the central planetary nebula nucleus (PNN) on September 1, 1886 from images taken at his observatory in Herény, Hungary. In 1935, J.C. Duncan discovered the nebula’s halo. Deep images have revealed that M57 has an extended halo extending to more than 3.5 arc minutes.